Find artworks, auction results, sale prices and pictures of Pompeo Girolamo Batoni at auctions worldwide. Pompeo Batoni (Lucca 1708-1787 Rome) Portrait of a lady as Flora, half-length, holding a wicker basket of flowers signed and dated \‘POMPEO BATONI. 1775\’ (center right, on the armband) oil on canvas, unframed 28 7/8 x 24 1/8 in. (73.4 x 61.3 cm.) Provenance Anonymous sale; Hôtel Drouot, Paris, 18 June 1912, lot 35 (720 F). Noël François Mutinot (1878-1965), Paris and the Loire, and by descent in the family, from whom acquired by the present owner. Pompeo Batoni (Lucca 1708-1787 Rome) Group portrait of the Hon. 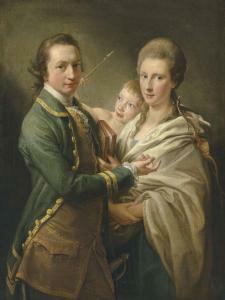 Arthur Saunders Gore, Viscount Sudley, later 2nd Earl of Arran (1734-1809), and his wife Catherine, née Annesley (1739-1770), with their son (? ), Arthur Saunders Gore, later 3rd Earl of Arran (1761-1837), as Cupid, three-quarter-length signed and dated 'POMPEIVUS BATONI PINXIT ROMÆ 1769' (lower right, on the hem of Catherine's shawl) oil on canvas 44 7/8 x 34 in. (113.8 x 86.3 cm.) Provenance By descent in the sitter\’s family. 53 3/4 by 39 in. ; 136.5 by 99.3 cm. From whom acquired in 2010. E.P. Bowron, Pompeo Batoni: A Complete Catalogue of His Paintings, New Haven and London 2016, vol. I, pp. 343–344, cat. no. 284. 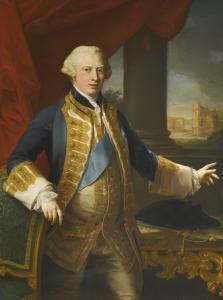 Edward August, Duke of York, was the first member of the English royal family to travel to Italy as a Grand Tourist. While in Rome between 15 and 28 April 1764, the Duke sat for Pompeo Batoni, Italy\’\’ \’\’s finest portrait painter, who enjoyed the patronage of Rome\’\’\’\’s most distinguished foreign visitors. This portrait is one of several signed versions, each of magnificent quality, including three in the Royal Collection and another formerly in the collection of Earl Howe at Penn House, Buckinghamshire, now in an American private collection. Earl of Fife and the Penn House version was given directly to Richard, Earl Howe. The canvas generally considered to be the prime, now at Buckingham Palace, was given to Sir Horace Mann, who later presented it to the Duke\’\’\’\’s brother, King George III. While the Duke\’\’\’\’s visit to Italy was not politically motivated, it came shortly after the end of the Seven Years War and elicited great interest. Many prominent members of Roman society were keen to ingratiate themselves with the new Hanoverian ruling family. In a vain attempt to elude attention, the Duke of York traveled to Italy in cognito as the "Earl of Ulster", but from the time of his arrival in Genoa on 28 November 1763 to his departure on 17 August 1764, his trip was documented in regular newspaper accounts, both in Italy and at home. His sitting with Batoni may have been organized by Richard Dalton who was librarian to the Duke\’\’\’\’s brother, King George III. Dalton travelled regularly to Italy to purchase works of art on behalf of the King and, given his knowledge of the country, would have played a key role in the coordination of the Duke\’\’\’\’s tour. Edward Augustus sat for Batoni wearing the sash of the Order of the Garter and the undress uniform of a flag officer. Batoni would have had a variety of backdrops for his sitters to choose from; the Duke opted to be depicted before one of Rome\’\’\’\’s most recognizable monuments, the Colosseum. Cardinal Albani implored the Duke to visit Rome during his Italian sojourn and entertained him at the Villa Albani outside Porta Salaria. The Cardinal also arranged for the British painter and antiquary Thomas Jenkins to act as the Duke\’\’\’\’s guide, or cicerone, for the duration of his trip while the art historian and archeologist Johann Joachim Winkelmann was tasked with advising him on the purchase of art. It is worth noting, however, that Walpole\’\’\’\’s view of the Duke was likely tainted, as the royal is said to have \“stolen a lady\” from him. Whether or not personal retribution was a factor, Walpole certainly did everything in his power to discredit the Duke of York, propagating the opinion that his tour of Italy reflected the king\’\’\’\’ s desire to distance his free-thinking brother from the British political arena. He stopped in the South of France where he was taken ill and died shortly after in Monaco, on 17 September 1767. 1. E.P. Bowron, under Literature, vol. I, pp. 340-344, cat. nos. 281-284. 2. J. Martin, \“Grand Tour Journal, 1763-5. MS,\” extracts published in E.P. Bowron, op. cit., vol. I, p. 341. 3. A.M. Clark, op. cit. 4. D.Goodreau, in Nathaniel Dance, 1735-1811, (exhibition catalogue), London 1977 (no page numbers). 5. E.P. Bowron, op. cit., vol. I, p. 340. 6. J.J. Winkelmann, Briefe, W. Rehm and H. Diepolder (ed. ), Berlin 1952, vol. III, pp. 39-40. 7. I. Bignamini, in Grand tour: The lure of Italy in the eighteenth century, London 1996, p. 34. 8. H. Walpole, The Letters of Horace Walpole, Fourth Earl Orford, P. Cunningham (ed. ), Edinburgh 1906, vol. IV, p. 480. 9. I. Bignamini, op. cit., pp. 34-35. 10. Ibid., p. 34. 11. H. Walpole, op. cit., vol. V, p. 65. The following condition report has been provided by Simon Parkes of Simon Parkes Art Conservation, Inc. 502 East 74th St. New York, NY 212-734-3920, simonparkes@msn.com, an independent restorer who is not an employee of Sotheby's. This work has been recently restored. Although the retouches are slightly discolored in a few spots, it can certainly be hung in its current condition. The canvas does not appear to be lined, and the stretcher is possibly original. The paint layer is clean and clearly un-abraded. 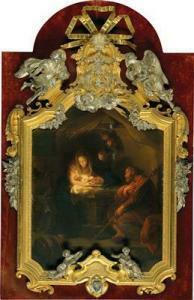 Even the fine details in the darker colors in the lower part of the picture are very clearly undamaged. The retouches that are visible under ultraviolet light are very few and far between. There are a few in the lower left, a spot or two in the white cuff on the left side, a few beneath the armpit in the red curtain on the left side, and a spot or two in the lower right. The pale blue of the coat on the left of the brocade and of the sash has received a few retouches. There are a handful of tiny dots in the face, none of which are significant. There are two restorations in the black satin collar. Other small retouches can be seen under ultraviolet light in the red curtain around the top of the head presumably addressing some pentimenti and in a few spots in the sky and landscape on the right. The condition is particularly good, and the work should be hung in its current state. "This lot is offered for sale subject to Sotheby's Conditions of Business, which are available on request and printed in Sotheby's sale catalogues. The independent reports contained in this document are provided for prospective bidders' information only and without warranty by Sotheby's or the Seller." This refined and engaging portrait of Sir Brook William Bridges, 3rd Baronet (1733-1791) was painted in Rome in 1758 by the leading Roman portraitist of the second half of the 18th century, Pompeo Girolamo Batoni. The sitter was the posthumous son of Sir Brook Bridges, 2nd Bt., whom he succeeded at birth, and Anne, daughter of Sir Thomas Palmer, 4th Bt., MP, of Wingham, Kent. He was educated at Eton in 1745-48, and was at Trinity College, Cambridge in 1752, and went on to undertake an extensive Grand Tour in 1757-60; he was recorded as being in Rome by 1758. A man of letters (the sitter went on to become a Member of Parliament for Kent, 1763-74), Bridges is shown three-quarter length wearing a fur-edged, green cloak, seated on a red chair, his right hand holding papers, with a quill and ink pot placed on the table behind. 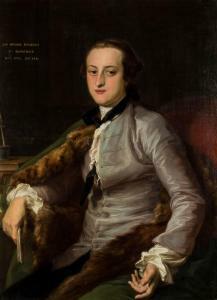 The portrait's composition, with Bridges' relaxed yet composed gesture towards the viewer, appears as an invitation to discourse that encourages one to engage with and admire Batoni's masterly rendering of varying textures, from the thick heavy fur-edged cloak, to the finely painted cuff of his shirt. Bowron writes of Batoni's portraits as being \‘the most remarkable artistic achievements of the period\’\’, and when one considers the exquisite execution of Bridges' hands and garments, coupled with the artist's expert employment of colour, with almost transparent glazes alongside areas of a thick rich paste, one is hard pushed not to see why Batoni was the leading portraitist in Rome in the mid-eighteenth century. The discernible patterns of Grand Tourist patronage reflect both the taste of the period and the aspirations of the sitter, yet unusually, Bridges was one of only two British patrons to sit both for Batoni and his contemporary rival, Anton Raphael Mengs (1728 - 1779). But while Bridges' patronage appears as exceptional for the British patron in Italy, the later history of his portrait ran parallel to those of his contemporaries. 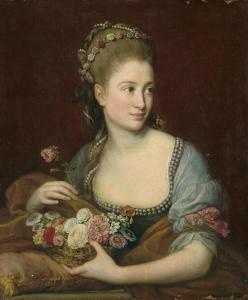 Between 1750 and 1760 Batoni executed nearly sixty portraits of British sitters alone, yet by 1800 the descendants of Batoni's famous patrons began to forget the fame of the artist, with many of the works becoming virtually unknown to the general public, remaining largely unseen except by a fortunate few. Bowron notes that 'only one painting seems to have been shown publicly in London in the artist's lifetime and none in Great Britain in the late 18th century or 19th'. The present work is one of these exceptional examples that displays Batoni's skill as a portraitist, has not been seen by the general public since it was commissioned, and has unbroken provenance leading directly back to the sitter.